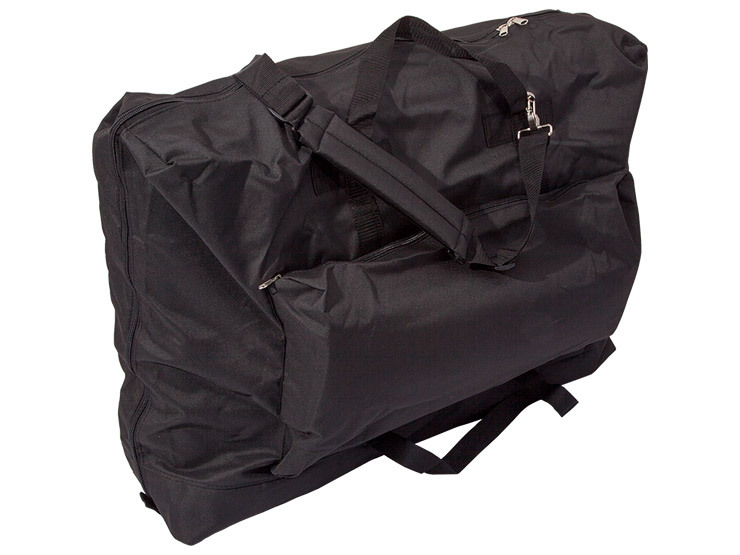 Protect your couch with our heavy-duty bag with adjustable strap. With years of experience supplying portable treatment couches, we’ve realised the tricks of the trade to produce the optimal carry bag. Available in 62cm width and will fit couches up to 22cm deep when folded. Reinforced base to prevent unpleasant holes appearing and slightly oversized for an easy and comfortable fit for your couch. Stronger and more reliable zips that won’t fail when you need them most. Shoulder strap that travels over the top from one side to the other, instead of from end to end, making your task of carrying even easier. We’ve also added an external pocket so you can fit some of your essentials, couch roll, bolster cushion, massage oil, etc. A very good quality carry case. However the size is too small for my massage couch and the zip broke quite quickly I guess due to wise issue. If there was a bigger size though I would by it again! I particularly like that is plain black without any logos on it and the nylon feels thick. Really good sturdy bag at a very good price. Just a bit too big for my treatment couch but does the job!